The sidewalk inscriptions in front of what used to be 116 West First Avenue commemorate N.B. Sprenger (top) and the Albany Elks Lodge. The mystery of the name in the sidewalk on Albany’s First Avenue — if a mystery it was — has been cleared up, as far as I’m concerned. On Nov. 23, I wrote about having stumbled across a name and year, “N.B. Sprenger, 1907,” pressed into the sidewalk on West First. And I wondered who that might have been. Cemetery and other records available online pointed me to Nicholas Sprenger, who was born in Germany in 1845 and died in Albany in 1921. I wasn’t sure about the “N” in the inscription, though, because it had eroded and could have been a “K.” And there was a question about whether First Avenue had a concrete sidewalk as early as 1907. At the Albany Regional Museum on Saturday, staff members Judie Weissert and Mara McKinney helped me find several photos in the published collections of the late Roberts Potts. The pictures show the Elks Lodge at the corner of First and Lyon in 1908, and the street and sidewalk outside the building clearly look paved. So it is quite plausible that the concrete sidewalk was poured in 1907. I used a fingernail to scrape moss and other crud out of the first initial. That done, the letter appeared to be pretty obviously an “N,” as I had first supposed. And it looked that way to Judie as well. According to Polk’s, in 1913 there were six separate property taxpayers with the last name of Sprenger in Linn County. Five of them had their property in “Shedds.” The sixth was N.B, whose property was assessed as having a value of $2,700. The directory also disclosed that the Albany Sprengers had a boarder, Elliott B. Sprenger, a relative no doubt and a teamster by trade. 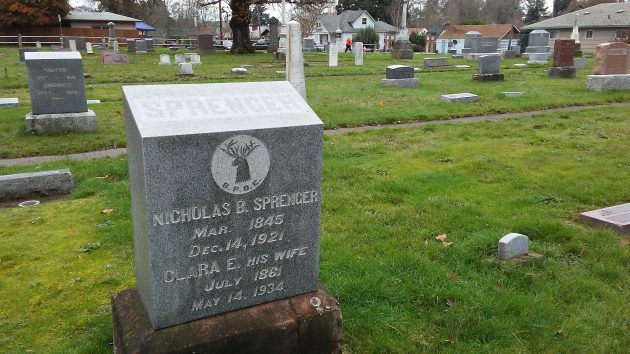 I paid a visit to the Masonic Cemetery off Broadway Street, where I had read that Nicholas Sprenger was buried. I wandered up and down the narrow walkways until I found his and Clara’s grave. As you can see in the photo below, the massive marker bears the emblem and initials of the Benevolent and Protective Order of the Elks, signifying that Nick was a member. That clinched it. Because a couple of feet away from the Sprenger impression in the sidewalk, there’s the mark of BPOE Lodge 359, presumably pressed into the wet concrete at the same time as the name. The Sprenger grave at Albany’s historic Masonic Cemetery. I always enjoy your articles. I always…well not always but mostly enjoyed your OP-ED pieces from way back when. Keep up the good work. One “mystery” solved but is there a second one? Looking at the headstone image, it appears to have an older stone base for the concrete to sit atop. A replacement? Stones/bases can vary widely in appearance, depending on how sunny/shady their location. Moss & lichens etc. can sometimes have a very adverse effect. The concrete mixture may have also been “different”. If you look in the NE area of Riverside Cemetery, some stones are virtually BLACK. Didn’t know what RFD meant? Hasso, you’re such a kid! This is like history detectives, Albany style. And they sure do not make stuff like they use to. 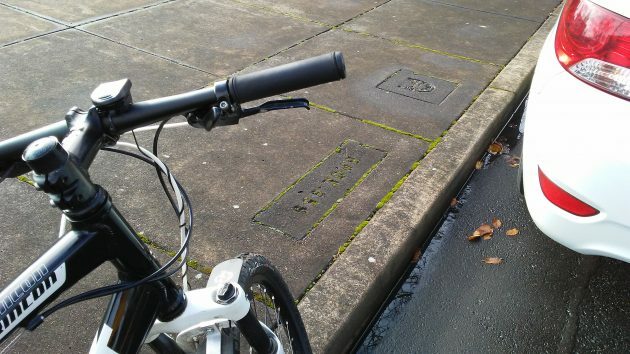 Glad to see that the concrete stamp was saved. It is disheartening to see all the concrete replacement around town, much of it the original first laid concrete. Thank you for sharing your discoveries, always enlightening and well-researched, of course. I agree with Gothic- history detectives, Albany style. Curiosity can certainly take you places. His father has a somewhat similar symbol on his tombstone.